What would it take to start a movement in which every new course proposal aimed for inclusivity and diversity? What would it take to have sustained conversations about diversity and inclusivity in course development and delivery? What would it look like if every required course syllabus was regularly reexamined with an eye for inclusivity and diversity? What would be possible if suggestions like these weren’t met with raised hackles or self-defensive positioning? What would first-year courses look like if each syllabus was designed to deliver introductory content and inclusive and diverse methodologies? What would department meetings look like if diversity was an agreed-upon requirement and practice for teaching and learning? What would you change about the syllabi you’re teaching this semester, were you to do a gender audit or an accounting for diversity of authors? Do these seem like impossible questions to answer? Do they seem all too familiar? Last week as I was grading procrastinating, I stumbled upon something very exciting happening on Aimée’s Facebook wall. An amazing discussion was unfolding about the need for, well, more public discussions about how we teachers replicate our own knowledge, and in so doing, unwittingly replicate our own biases. Without reproducing the discussion in full here, the gist was this: despite it being *shrug, mic drop* 2015, syllabi are, for the most part, remarkably lacking in inclusivity and diversity. Why? Once we are in a position to be hireable to stand at the front of a classroom and teach, presumably we have developed a degree of expertise. Expertise may be in the content of your research, or in your learned ability to structure compelling lecture-techniques to deliver content. You may be an expert at walking into the room and guiding discussion with no notes. But none of us are wholly expert in all things. That belies the definition of what an expert is. And so we are, as teachers, both able to stand tall in our own areas of expertise and, I should hope, recognize where we each, all of us, have room for improvement. For consultation. For collaboration and learning. Right? Maybe collaborative discussion is happening around learning outcomes and syllabus development in your department, and then again, maybe not so much. Maybe not at all? Certainly, not enough. As I watched the conversation unfold it became clear that while there may be a deep desire for meaningful and sustained conversations and practices around creating inclusive and diverse syllabi, most of the people involved in the conversation were not seeing that in their own departments. But rather than fall into frustrated silences the people Aimée had a suggestion: why not start a discussion and collaborative brainstorming/resource-sharing movement on Twitter? This reminds me of another version of Marcia Chatelaine‘s #FergusonSyllabus, which used Twitter first as a call to action in the classroom, and then as a collaborative brainstorming session about how to facilitate meaningful discussions about racism in America in a variety of learning contexts. This suggestion also makes me think of the shadow syllabus. This is the hashtag Aimée has devised, and we’re getting started today! Can you describe the Facebook friend request icon? Try to call it to mind without immediately reaching for your phone. Can you do it? I couldn’t. So, earlier this week when the new “feminist revision” of the Facebook icon was making the rounds on social media I had to look to see what the heck was being referenced before I could even join the conversation about what these new feminist revisions were all about. Does anything strike you about this image? Good news, right? The Ms. Magazine blog certainly thought so; last Friday they covered the icon shift in a short piece entitled “We Heart: Facebook’s New Feminist Icon.” But is this new icon really feminist? I’m not so sure. Whatever set of definitions you adhere to I’d wager that the common denominator in discerning whether a given action is feminist entails a combination of intent and consistent commitment. One cannot be a feminist some of the time, for example. Systemic inequity is pernicious and requires vigilant and sustained attention, right? 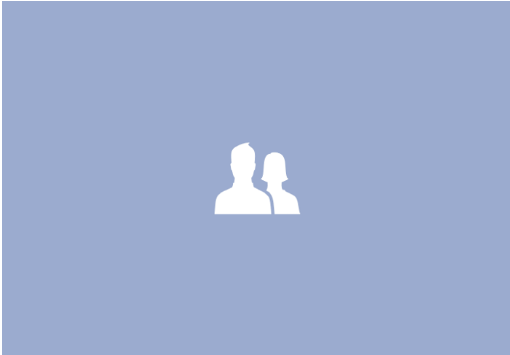 So in the case of this Facebook icon, is it a feminist change if only women and women-identified Facebook users see the new updated image? I kinda don’t think so. Feminist digital humanist Jaqueline Wernimont and her colleague @JenProf started wondering if in fact the new woman-in-front icon was visible for everyone. Guess what? It turns out it isn’t. The two put together a short and sweet survey called #WhosFirst that asks how people identify themselves to Facebook–ie. 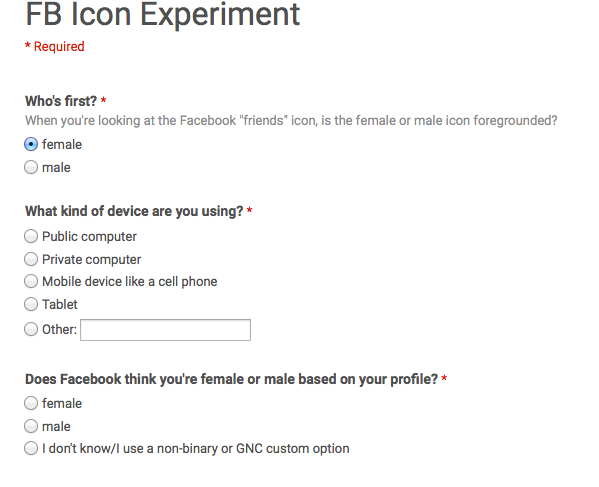 how do they gender identify when signing up– and asks what their friend-request icon looked like. You can find the full survey — and participate! — on Jaqueline Wernimont’s blog here. The results are telling. As of July 12th a full 33% of respondents see the old man-in-front icon. Here’s the thing: systemic inequities are sustained in part through pernicious repetition, which normalizes them. Inequity is difficult to remedy because it requires consistent and tireless vigilance. It requires being the feminist killjoy at the table who says ‘sure, that’s great, but…’ when a job is only partly accomplished. A survey such as #WhosFirst picks up where the image shift left off. By gathering data from participants the survey starts to add critical information that allows us to think more carefully about how gender inequity, not to mention heteronormativity, is represented and how it is reinforced. Further, building a survey, gathering data, and translating that data into a comprehensible, publicly ingestible narrative is hard work. It is feminist labour. Indeed, it is feminist labour that in this case is giving more critical depth to an action that has been uncritically lauded as feminist. And that’s the thing, isn’t it? We can’t just hit ‘like’ and move on. That’s not how social justice works, not in embodied life; not on the internet. Instead, we need to remain vigilant. We need to ask the follow-up questions. We need to collaborate and help each other do the small and big jobs of unearthing and presenting the text and the context. And we need to keep issues of inequity at the forefront of our research as well as our social media chatter and our daily lived experiences. That’s the work of feminism. That’s living a feminist life. You can participate in the survey here and engage in conversations on Twitter using the hashtag #WhosFirst.